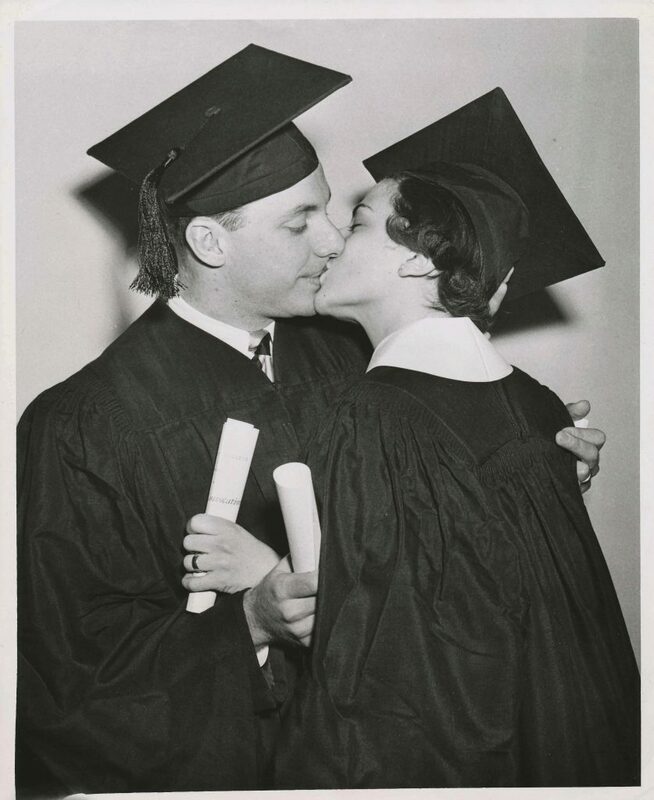 Marcy and Robert Brower, 1950 graduates, were the first married couple to graduate together from Roosevelt. I just received the new magazine for fall 2014 celebrating 70 years of the opening of Roosevelt University. It brought back many memories. I would like to share some of them with you. My husband and I were featured in the Sun-Times as the first married couple to graduate together from Roosevelt. The date of Jan. 29, 1950, was also the first anniversary of our marriage as well as our graduation date. In 1946 I was an 18-year-old, recently having graduated from Sullivan High School and not expecting to be able to attend college. No one in my extended family had ever gone to college. Although I was an excellent student, my mother as a single immigrant mom was not able to afford college for me. I was also expected to help with expenses at home and care for a younger brother. On a whim, I applied for a scholarship at Northwestern University and received a letter stating that I was qualified but their scholarships for Jews were filled for that year. Thinking I would receive similar letters from other schools, I gave up the hope of a college education. One day during the summer a friend and I were walking on Michigan Avenue looking for a job. We were stopped in front of the Auditorium Hotel by a distinguished looking gentleman named Helmut Hirsch, a history professor, who asked if we were in college and if not, were we interested. Of course, we were and wondered why we were asked the question. Dr. Hirsch explained that a new college had opened that had no quotas and was going to be dedicated by Eleanor Roosevelt with a diverse faculty and student body and with a philosophy of inclusion and democratic principles. After checking my high school records I was offered a full scholarship and thus I entered Roosevelt. At that time Roosevelt was located on Wells Street in an office building. I remember the el passing by a window and temporarily not being able to hear the professor until it passed. In 1946 Roosevelt had many faculty who had fled the Nazis and older students entering college on the G.I. Bill. You can’t imagine the wonder of it all for an 18-year-old. It was an exciting time, new experiences, being introduced to new ideas, being exposed to people different than I, and becoming part of an experiment in higher education, John Dewey and collaborative learning. My education also extended beyond the classroom to the coffee shop where there were always very animated freewheeling discussions on every subject imaginable. Harold Washington was a student at Roosevelt at that time and I remember him listening intently and sometimes joining the discussions. Who would have thought at that time that he would become mayor of Chicago? The following year Roosevelt moved to the Auditorium Building. My fiancé came home from the war and started at Roosevelt too under the G.I. Bill. We decided to get married after our junior year if we could manage financially. As students we met another Roosevelt couple who were graduating and leaving their room in a settlement house a few blocks from Hull-House on Halsted Street. Consequently we moved into Henry Booth House and had rent and food if we worked part time with the children there while we went to Roosevelt. It was the perfect solution for us. The only other residents at Booth House were an African American couple, an Asian woman and a director who was a group worker known for her work in the largely African American community. Sixty years later we still are in close contact with people there. If not for our experience at Roosevelt we never would have had the opportunity. So began a new and life-changing experience for us. The lessons we learned have been reflected in our work with children and schools as educators. Even more important, they have given us a greater understanding and appreciation of ourselves and others. Thank you Roosevelt for our growth as people valuing inclusion and involvement in the world we live in. Our lives have been and continue to be altered by our Roosevelt experiences. The direction our lives took is a testament to the growth and sensitivity we experience at Roosevelt. Thank you for being the institution you represent as a model for what it means to be an active and participating citizen in a democratic society.